Our scarves are all gone! We regularly host days at area hospitals where we share Hope Scarves directly with patients there for treatment. Yesterday was one of those days. 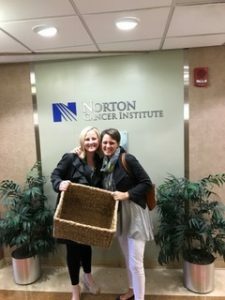 Amy, Director of Hope Scarves, and I spent the morning at Norton Cancer Institute. It was exhilarating and exhausting, sad and happy, frustrating and encouraging. We met 25 women – each with their own unique story. We laughed and cried together as we shared our common bond – the audacity of hope. Let me share a couple with you… (names changed to protect their privacy). Sara is 78 years old, wheeling herself in on her own in a wheelchair. Didn’t even want my help opening the door. As we spoke, she tugged on her green scarf and told me “this is one of those Hope Scarves. It’s my favorite.” I gave her another and a big hug. A beautifully classy woman sat nervously strumming her bracelets as her family and grown children waited for her name to be called. I asked if I could sit with them and introduced myself and Hope Scarves. She told me that after 12 years she had just been diagnosed with metastatic breast cancer. In her 70’s she has a very high quality of life and was struggling with the idea of toxic treatments. We talked about living life over cancer one day at a time and doing things that bring you joy. I shared a Hope Scarf with her and hoped it would live up to her clearly high fashion taste. We hugged and I gave her and her family my email address to keep in touch if she had questions as they make treatment decisions. They gave me a $40 donation and asked what they could do to share the program in their community. 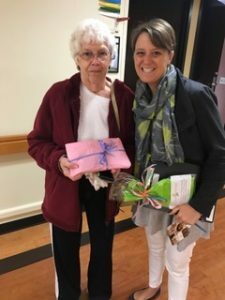 When I saw her an hour later – she was beaming after a positive conversation with the doctor on treatment options and side effects. We hugged as she stepped into the elevator and I said a silent prayer that she may hold onto that joy. I talked with a cancer survivor who is BRCA+ (the gene that triggers breast cancer) about sharing her story. As she sat nervously in the waiting room she explained that her 20-year-old daughter was with the doctor and had just found out she too is BRCA+. We talked for ½ an hour about living life one day at a time and grounding yourself in hope. A nurse excitedly called me up to the desk to tell me one of their patients was there today to return her Hope Scarf. When I met Myrna she hugged me and thanked me for the scarf. Through her pancreatic cancer treatments one of the hardest parts was loosing her hair. She told me how much the Hope Scarf helped ease this sadness. 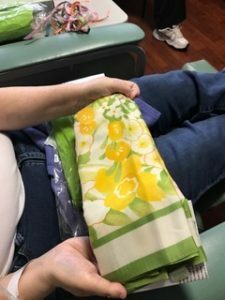 In her story she writes, “I wore this scarf as a symbol of hope and my defiance against cancer.” I can’t wait to send it on to someone else who needs to hear Myrna’s story. This is Myrna – she was glad to share her name and this great picture when we met. Denise’s body was weak from countless rounds of chemo for incurable kidney cancer, but her spirit shined in her smile. She told be she had two things yet to do: be a grandma and see her daughter get married. She showed me a picture of her new grandson and then shared the exciting news that her daughter just got engaged. We talked about the wedding and made plans for her to come in to Hope Scarves to pick out a wedding scarf once she had her mother of the bride dress. As her weary body rested in her wheelchair she and her husband talked about how strong their love has become through this experience. His eyes filled with tears. She held his hand. I don’t really want to spend one more minute in a doctor office than I have to. But, the people we meet through Hope Scarves are worth it. I am humbled by how much it means to each person when we give her a scarf. When she opens up her package and reads the story, magic happens. And I hope that they each feel the same love and support I did way back when as I wore Kelly’s scarves. This is the audacity of hope. Each of these women are facing different challenges. A whole room full of patients on a beautiful spring day. Struggles, tears, fears seeping from the stuffy waiting room. So much sadness, so much joy. 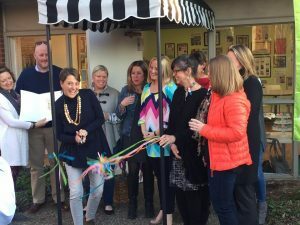 And the sisterhood of the traveling scarves binding us together – lifting each other up, finding common ground and strength in our stories and our shared scarves. 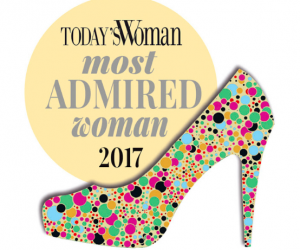 I am touched to have been nominated to Today’s Woman’s Most Admired Woman Award in the non-profit category. Asking f or votes for something like this is hard for me, but after encouragement from folks around the office – I am shooting off a quick blog post with the link if you’d like to vote. Voting ends tomorrow, March 22 at noon. You can vote every day. It’s pretty humbling to be recognized in this way. I am honored to have turned my personal experience with cancer into something meaningful to help others through Hope Scarves. What a joy it is each day to make my passion my work and have so many caring, kind people come along side me in this effort. 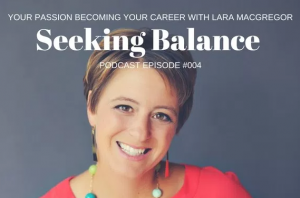 I also recently had the chance to share my story through the Seeking Balance Podcast. A place where entrepreneur mom’s share tips, tricks and tactics for raising babies and companies. Click here to listen to my wisdom…. ha!! After months of renovations, I’m excited to share Hope Scarves moved into our new office space. With a packed house, we had an official ribbon cutting and a proclamation from the Mayor of Louisville that March 16th is officially Hope Scarves Day. The new space provides nearly 4 times more space for our expanding Scarf Collection, more capacity for volunteers and first floor exposure for the world to see all the good work happening here. I’m excited to see what this next chapter holds for Hope Scarves. I believe the best is yet to come! Check out more pics on our facebook page. Thanks – as always – for your interest in my story and support of the work of Hope Scarves. A day doesn’t go by that I don’t pause with gratitude for this time of stability and wellness…in my hopeful life. Shine your light and live each day to the fullest. But, instead of enlightenment I found more pain. I kept thinking this is what I need to do – I need this program to help me continue to live in the light. I must do all this – I must step out of my comfort zone if I want to grow. I have to pass through the messy and painful to get to the bliss on the other side. I love all the values of the program – the laws of transformation include; commit to growth, shift your vision, relax with what is, be true to yourself…. It’s beautiful. It’s what I want to do. I sought out this program to help me answer the deep question I have been wresting with – how do I live the most beautiful life I can? I desperately want to feel, to know, I am doing all I can to live each moment to its fullest, most brilliant potential. I’m seeking some kind of reassurance I am making the best choices. When I dug deeper I uncovered a whole lotta pain. The reality is when you live with a terminal illness there is no end to the messy. And it’s not just messy – it’s repulsive. By digging in I was digging myself into a hole filled with uncertainty, sadness, fear and death. A hole without light. By adding extra requirements to my already busy day I was stressing myself out. I work to focus my intention on balance and be fully present with my kids. This was becoming increasingly hard. And, the sense of comfort I had that I was living the most beautiful version of my life was slipping away as I questioned my eating, my priorities, my decisions. My anxiety increased and my fears started to deteriorate my ability to make decisions. Jay asked me what I was trying to get out of the program as he had noticed an increased level of fatigue and agitation. I told him my hopes for a deeper sense of purpose and clarity on how to live the best life I can. I am looking for some kind of reassurance that as the time bomb is ticking – I am doing everything I can to make the most of my time. Our time. He reminded me – that’s been a goal I’ve had for the past couple years and that I was doing a pretty good job of it… before I set out on this new personal revolution. This week, I lost another friend to metastatic breast cancer. A young friend from Louisville with two adorable boys – the same age apart as ours. A friend who was terrified of her disease but found a way to live and love and persevere hoping she could hold onto the normalcy of life as long as possible. She did it her own way. And, although her kids won’t feel her hug again – her love is deeply planted inside them forever. She was someone I looked up to because she lived her life as normal as possible – she didn’t let this disease interfere with her joy. At a time when I am wanting so desperately to do this life “right.” Nikki’s death reminds me how fragile life is. I want to live the most beautiful life possible. But, there isn’t a perfect diet, lifestyle or program that will make this happen. I want to simply focus on LIVING it – not questioning it. Here it is – I am so not a quitter… but, I am not going to be able to finish this 40 days program. It’s a remarkable program and I admire all the people pushing through and digging deep. But it’s not for me at this point in my life. Instead I will beautifully revolutionize in my own unique way. In body, mind and spirit. I might not get the free t-shirt but I will continue to work to make peace with my questions. I promise to hold myself sacred. Acknowledging that by living with intention my revolution happens one day at a time. And, that in and of itself, is the most beautiful life I can live.